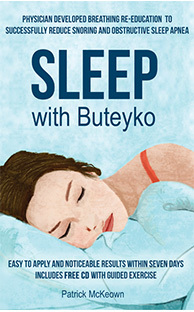 Sleep with Buteyko documents how to apply the Buteyko Method to address snoring, sleep apnoea and insomnia. Each exercise is described in detail using plain and simple language to allow the reader make maximum progress. Part two of the book documents the science behind chronic hyperventilation and how it contributes to snoring, sleep apnoea and insomnia. 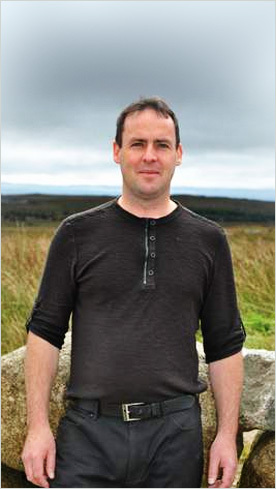 The CD involves Patrick McKeown guiding the listener through Buteyko and relaxation to address snoring, sleep apnoea and insomnia. 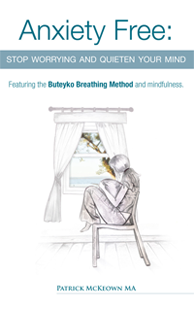 “Anxiety Free: stop worrying and quieten your mind” is a self help book detailing Buteyko breathing exercises and mindfulness to help those with panic attacks, anxiety, stress and depression.Included is recognising the effects of chronic hyperventilation, how to measure relative breathing volume, reduced breathing to address chronic hyperventilation, breathing exercise to stop anxiety, racing mind and panic attacks, bringing attention to the inner body, living in the now, recognising your thoughts and how to step outside of thought. Chapter 10 – Can you afford not to have a still mind? Chapter 11 – You know all of this! Asthma Free Naturally is now available from amazon.com or from bookstores throughout the USA. 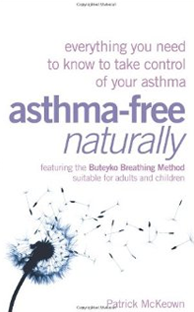 It is consistently the best selling asthma book in the UK and Ireland for the past three years. 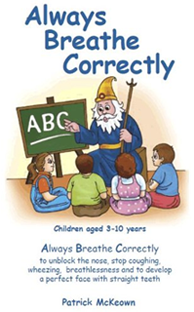 Written by clinic practitioner Patrick McKeown, this self help book contains many breathing exercises including those for children, theory detailing hyperventilation and asthma and is supported by references throughout. Diagrams and simple language make this book very user friendly. 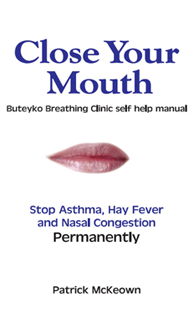 Close Your Mouth -the Buteyko clinic self help manual is the most user friendly book on the Buteyko Method to date. Photographs, diagrams and simple uncluttered text explain application of exercises with a minimum of words. Simple, user friendly and effective. ALWAYS BREATHE CORRECTLY THE COMPLETE SELF-HELP MANUAL TO UNBLOCK THE NOSE, STOP MOUTH BREATHING, CONTROL ASTHMA, IMPROVE CONCENTRATION, AND DEVELOP A PERFECT FACE WITH STRAIGHT TEETH. 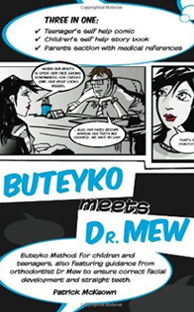 “Buteyko Meets Dr Mew” is a full colour selfhelp book containing the complete instruction of how to apply the Buteyko Method for children and teenagers. Free chapters from this Buteyko book for children are available by clicking here. Combining the work of Dr Buteyko and renowned London based orthondontist Dr John and Dr Mike Mew, this book addresses negative growth of childrens faces due to mouth breathing. In short, mouth breathing children commonly develop narrow faces, crooked teeth, undeveloped jaws and poor facial features. To ensure that a child or teenagers face develops as it should, the mouth must be closed! This book has three sections including a comic strip section with self help buteyko for teenagers, parents section with detailed medical references and childrens section with story book and breathing exercises. Written in a user friendly style, numerous illustrations and full colour. An abstract from the journal General Dentist is as follows; “Mouth breathing: adverse effects on facial growth, health, academics, and behavior.” states that; The vast majority of health care professionals are unaware of the negative impact of upper airway obstruction (mouth breathing) on normal facial growth and physiologic health. These children do not sleep well at night due to obstructed airways; this lack of sleep can adversely affect their growth and academic performance. Many of these children are misdiagnosed with attention deficit disorder (ADD) and hyperactivity.